Sunny .. sort of .. Sunday .. my “winter sowing of summer seeds” is progressing very well. 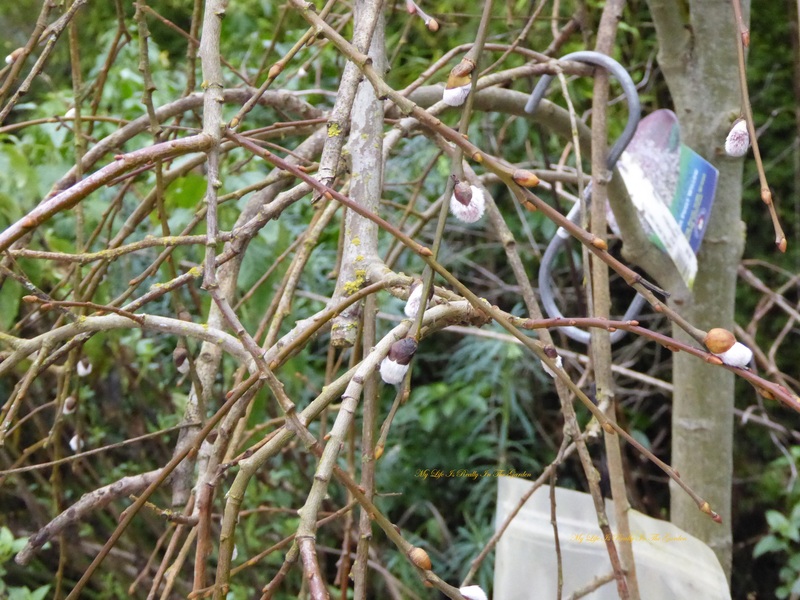 This year I carefully labelled everything, writing the type of seed neatly, with permanent ink, on garden markers. And I wrote the dates and details of each seed that I sowed into a hard covered notebook. How veddy veddy mature, wouldn’t you say! 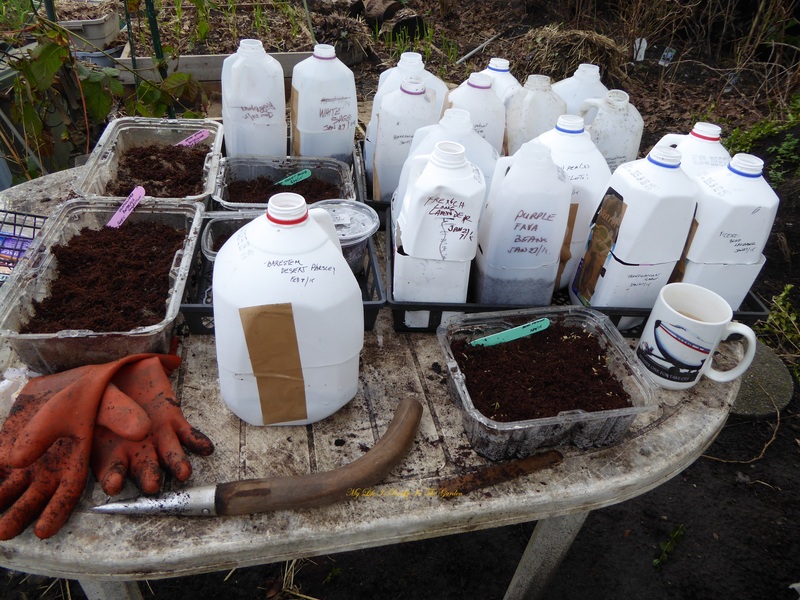 Last year I emptied the full packets of seeds into the containers. And the seeds grew so well that I had way too many seedlings. So this year, I only sowed partial envelopes. Except for some wild flower seeds and nodding onions (which my pal D, gave to me). I can be constrained for so long and then just throw caution to the wind, as it were. Here are some of my containers. I ran out of milk jugs and decided to use the clear containers from lettuce and berries .. they worked out just as well. Many of the seeds that I started at the end of January have sprouted already!! 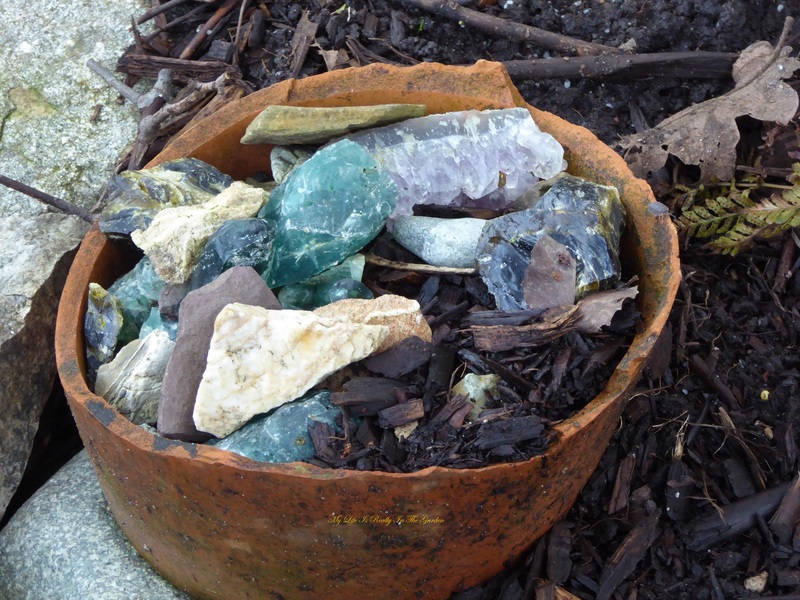 Here is a container of glass chunks that I uncovered when I was digging and sifting the ground, a few years ago. There used to be a glass factory in the neighbourhood and our property sits on a portion of it. I’ve uncovered a few cement foundations that I was going to use for a garden feature, but decided that it wouldn’t work out well so I covered them up. The greenish glass is rather pretty and I’ve been thinking how best to show them off to their best advantage. Still working on that. I use a fair bit of coconut coir in the garden, buying blocks of the compressed material and I leave them outside to crumble in the rain. 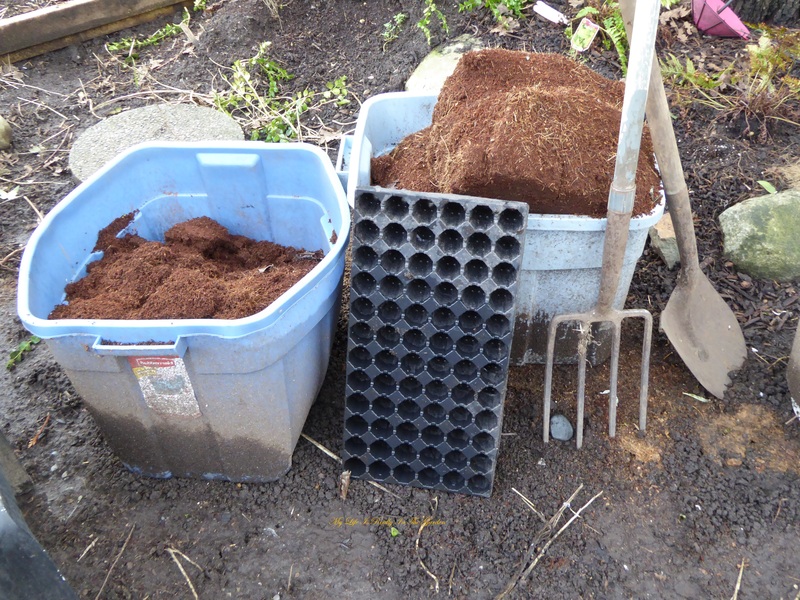 Far better than using peat moss, which is a non-renewable product, compared to the readiness of coir. The plant cell flat is just waiting for the seedlings to grow a bit bigger so I can prick them out of the milk jugs and plant them in these cells. Ah .. garlic. 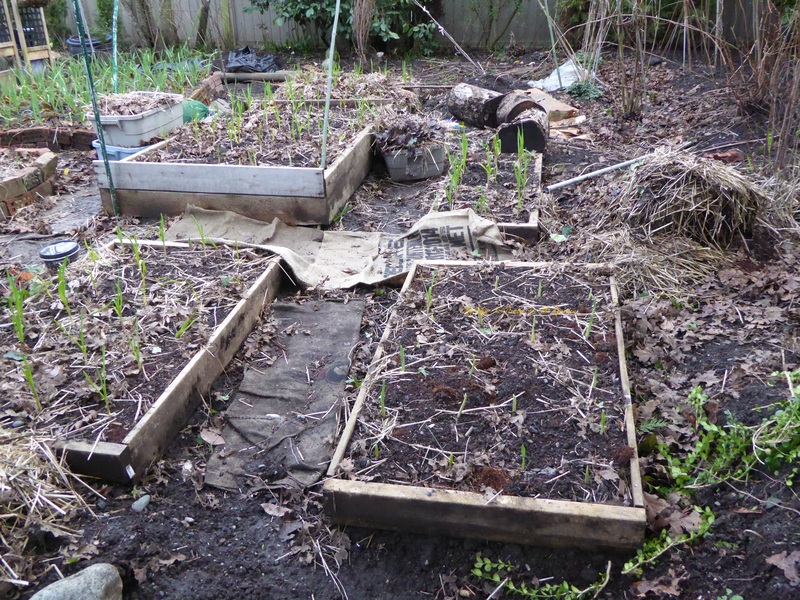 This was the year when I was only going to grow garlic in just 2 areas of the yard. I’d created 2 temporary garlic beds, creating circles with 2 levels of brick. Wonderful new soil, mixed with glacial rock powder, coir, compost. I’d placed way too much organic straw on the bulbs and had to remove most of it to allow the greens to welcome the rays of the sun. 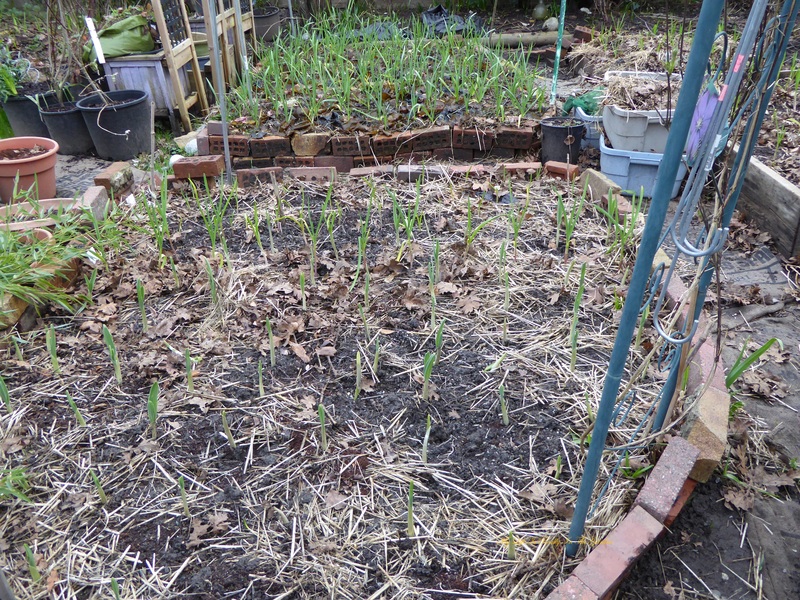 So, here are my two garlic beds. 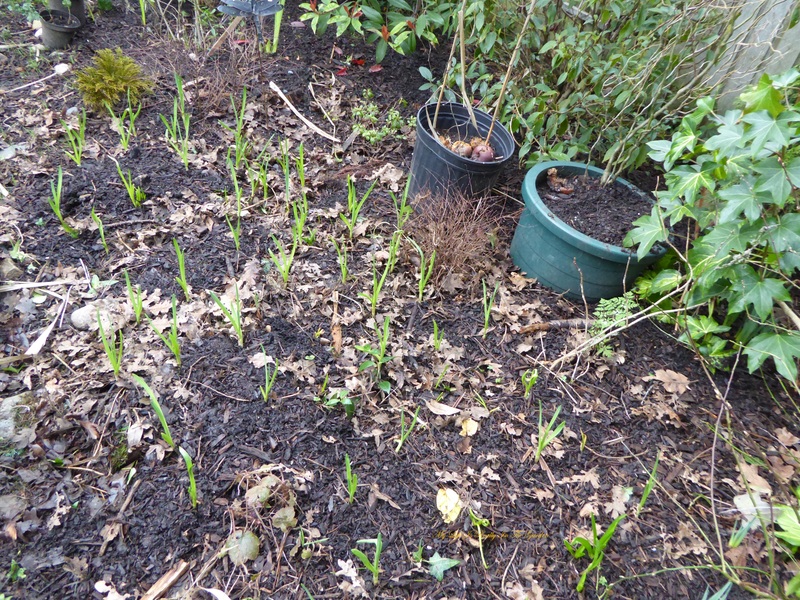 However, as I still had lots of garlic left, I thought, why not plant a few more cloves? So I did just that. I created forms with bits of wood that my DH had in his workshop. Fastened them together with screws, filled with the above mentioned soil and planted the garlic. Ok, thus far. But, wait, I had a few more garlic cloves, sprouting greens, and I thought, what’s the harm in planting these. So, this is part of the side of the yard. Garlic happily growing there. Lots of seaweed tucked around them. 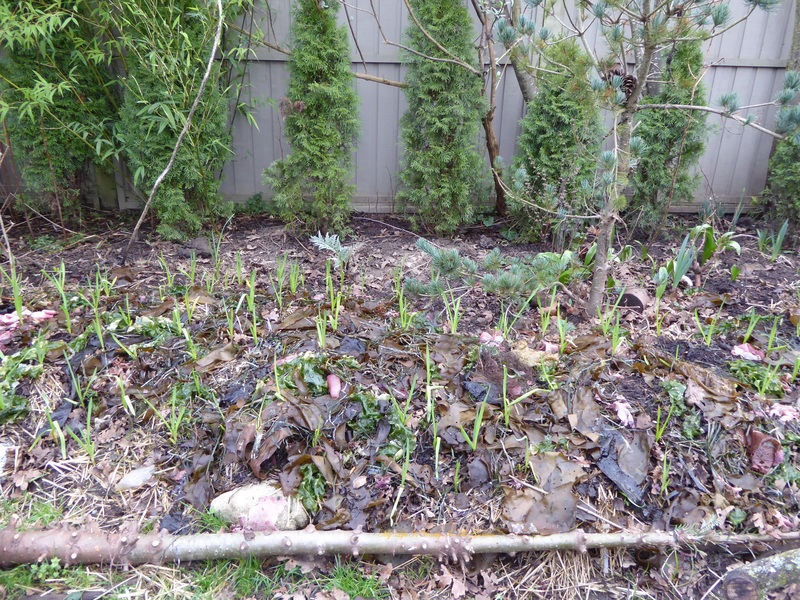 Then I noticed more cloves sprouting, so I planted a few more on the other side of the yard. After this, I planted some more by the garden gate, but haven’t yet taken a photo. I’m hopelessly in love with garlic. And dream of growing much more than this. Last fall I wasn’t able to “tidy up” the yard and thus there is still lots of things to do. I found a container into which I had tossed a pile of bulbs and had forgotten about them. I discovered some interesting things. 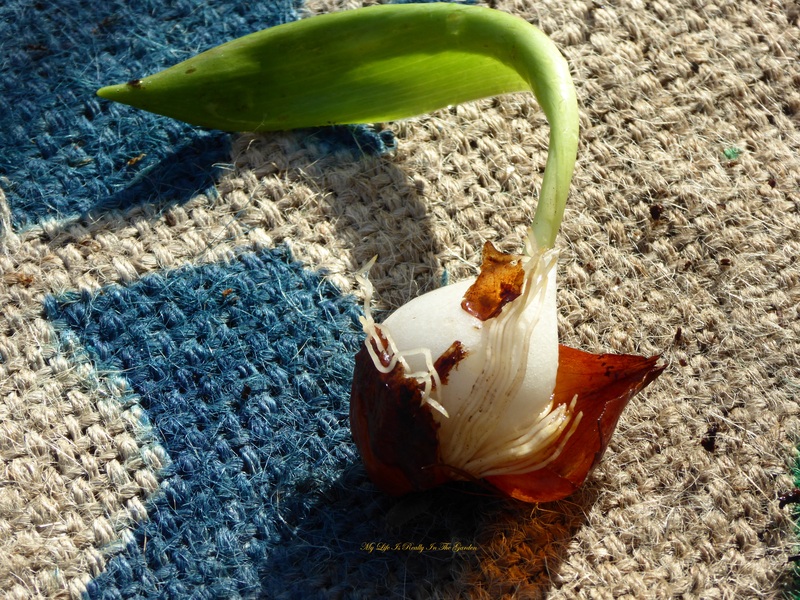 One was that this tulip bulb, thrown upside down in the pot, was still determined to grow roots and see how they have grown! Another thing I discovered was the magic of bulbs. Determinedly flowering away despite the lack of soil. No care whatsoever. So what’s a gardener to do? Well, I potted them up, that is what! 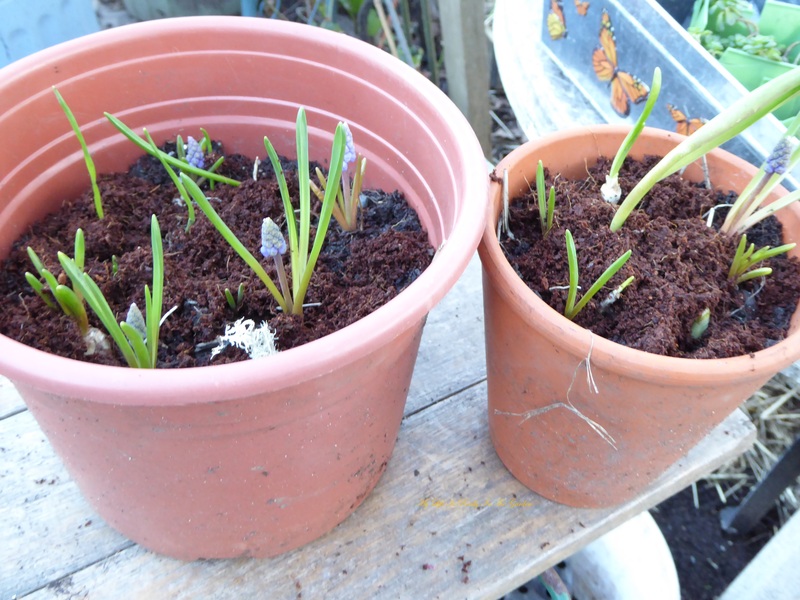 I think these are Muscari bulbs, quite pretty. 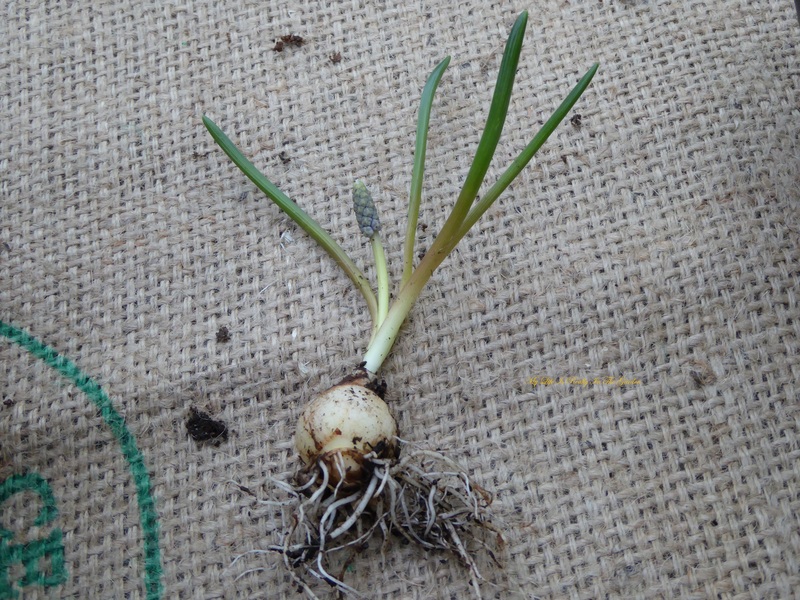 Grow on, bulbs! I took time to walk around the yard. And I stopped by one of my two dwarf weeping willows. One is quite strong (this one) and the second is needing a bit more love and care, which I happily supply. 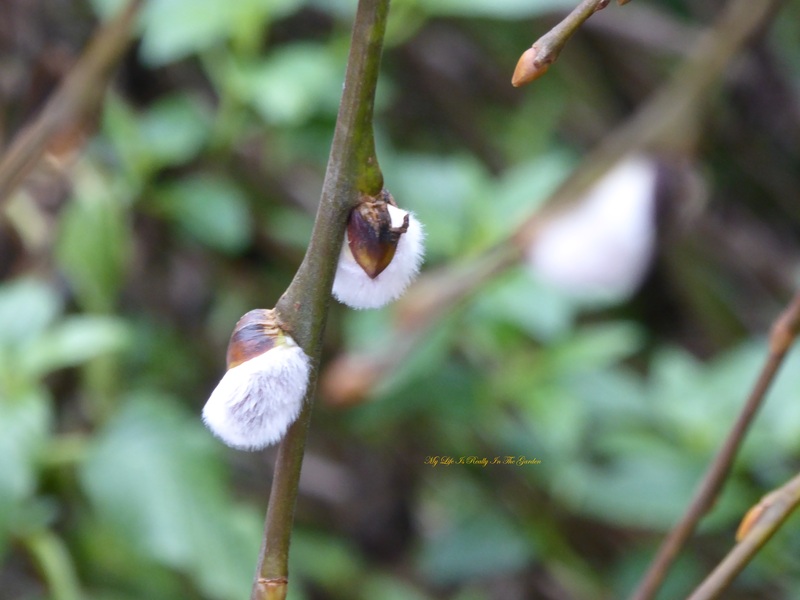 How sweet are these diminutive little willow buds. 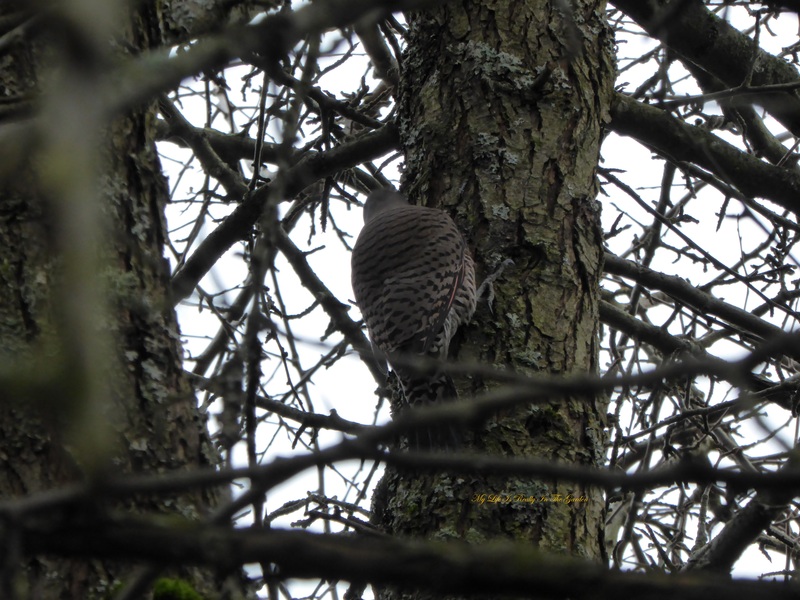 There are a couple of Flickers who visit the yard. They really seem to prefer one of the plum trees for some reason. And at this time, one was hunkered down by a suet block. 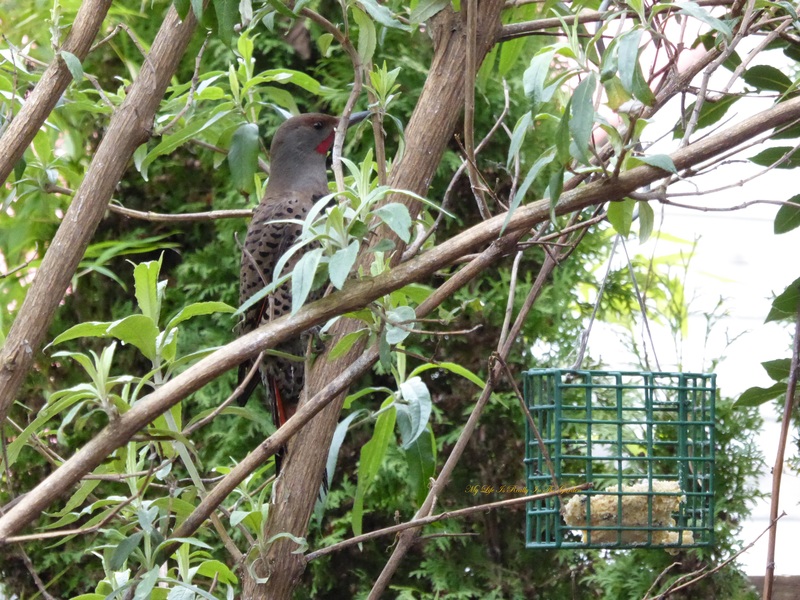 He did spend some time wrapped around the suet container, plucking out lots of the suet and now he was taking a break. 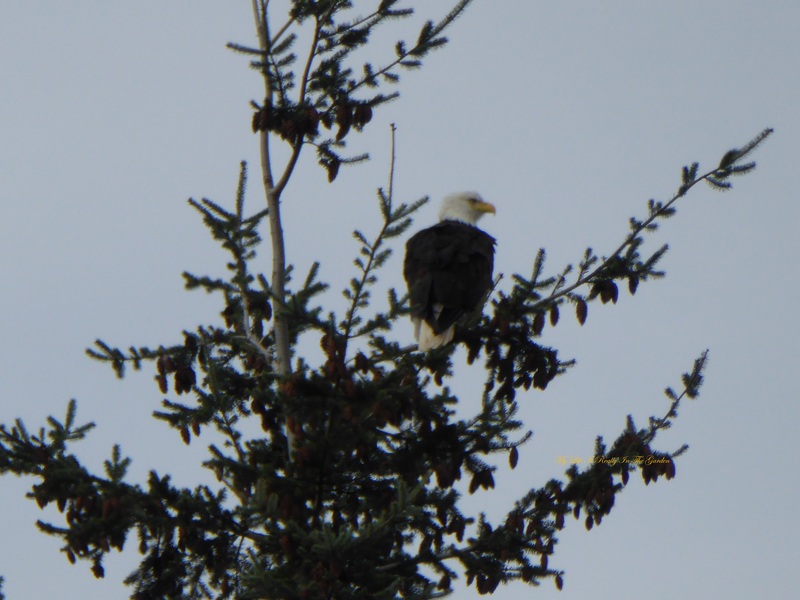 Later on, he perched onto the trunk of the wild and crazy tree. He stayed there for quite a long time. Whether resting, or hiding from a raptor .. I didn’t know … I just was happy that he had a place to rest. 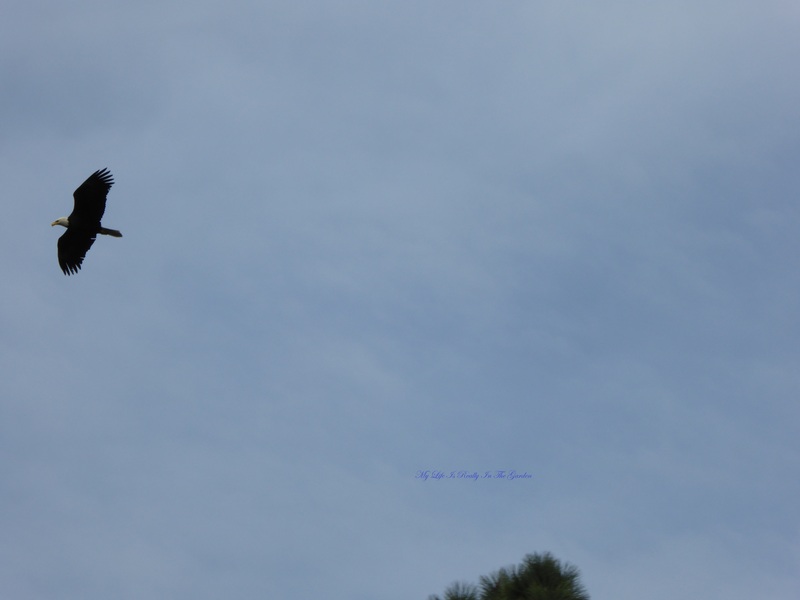 A short time later, I was unloading things from my car when I noticed this eagle flying overhead, so I quickly got out my camera and clicked away. 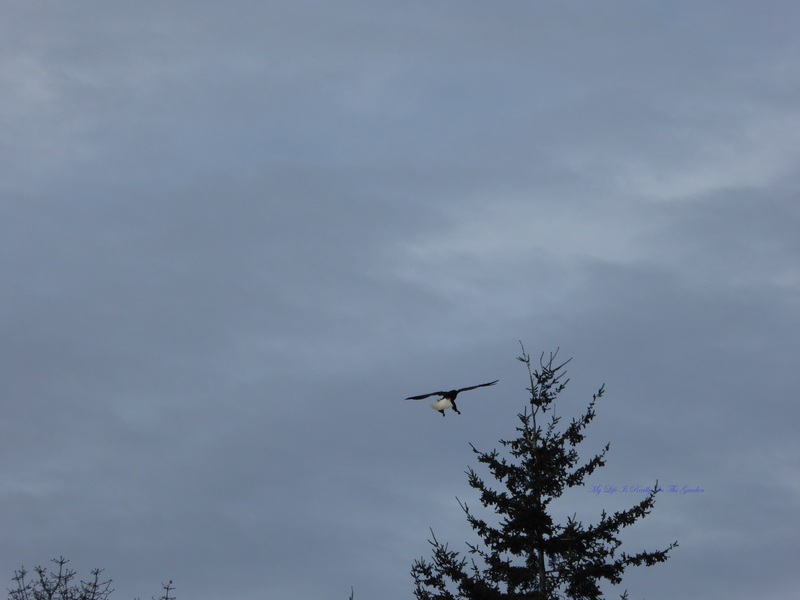 And he landed atop a tree way down the road. I just stood there for awhile, leaning against my car, clicking away, while this majestic raptor looked around, patiently, for the next meal. 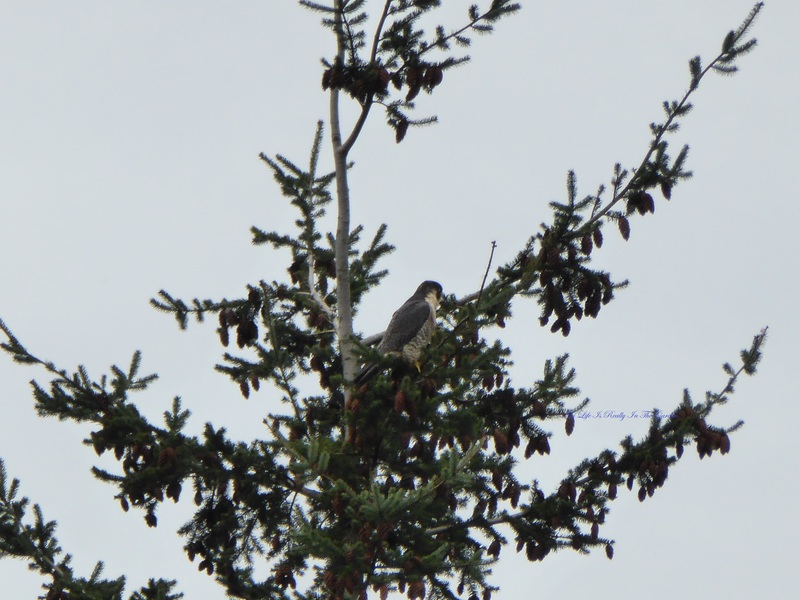 When the eagle left .. the Coopers Hawk took up residence. Categories: Uncategorized | Tags: coconut coir, Cooper's Hawk, dwarf drooping willow trees, eagles, Flickers, Garlic, glass factory, muscari bulbs, raptors, the magic of bulbs, winter sowing summer seeds | Permalink.